The article I have written is regarding a place called The Moot Hall in Maldon, Essex, England. I have investigated this place in the past and thought you might like to feature the story on your website. The Moot Hall in Maldon is a place I had the pleasure of visiting for myself, and had a couple of anomalous experiences that I was lucky enough to investigate at the time they happened. Before I tell you about the paranormal side, I would like to share with you the buildings history, and its numerous uses over they years. 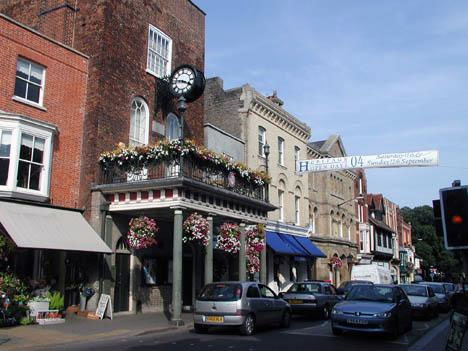 The Moot Hall hasn't always stood at its present location; it was in fact a bit further up the road on the corner of the high street, on a row of shops adjacent to the also historic blue boar hotel. Moot is a Saxon word meaning place of assembly, the hall was started in 1435 at the request of Robert D'arcy when he had a brick building constructed on the site. It was raised in height to form a tower like building later in the fifteenth century; it was completed as such in 1576. King Henry VIII granted Maldon rights as a court of admiralty in 1528 and the crowned matrix of the seal is still held within the walls of the building to this day. The corporation of Maldon purchased the building from Thomas Eve in 1576 for a price of just £55. Eve, a linen draper and freeman of the borough, worked to render the building useful as a moot hall, the present balcony now replaces a front gallery that was built onto the hall. Maldon has had a mayor every year since the town's local government was changed in 1687. The second floor of the building now houses the town's council chambers where meetings were held regularly to decide the town's key developments. This came into use in 1687, with a mace being made later in the same year. The town records were also kept at the hall, until they were moved to the Essex records office in nearby Chelmsford. The first floor held the town courthouse with the ground floor the police station and prison cells. The courthouse was in use up until the 1970's and the ground floor prison cells have a small exercise yard to the rear where names of convicts have been scratched into the walls, and the dates they were held are also visible. The police station was in use for Maldon's own police force from 1839 until 1889 when it became the county police forces station until 1914 when the new police station was built in west square. On my first visit to the hall I was lucky enough to talk to the tour guide who told me of some of the experiences she has had in the hall. She described seeing shadowy figures gliding across the rooms, hearing footsteps when there was no one else in the building. she said this makes her feel uneasy and like she is being watched. I have also experienced anomalies whilst I was there. On the first occasion whilst I was speaking to the guide, myself, the guide and another person all heard the sound of a door being closed with force on one of the upper floors (we were in the downstairs old police station at the time). We were the only people in the building and we can be sure of this due to the fact that the only access to the upper floors is via another external door, which was in fact locked at the time. We hastily headed up and checked all the doors, to find them all closed. The guide then pointed out to me that she had already closed all the doors after the last tour, so any door that would have closed on its own, would have to have opened the same way, unassisted. We found this occurrence very interesting. On the second visit I took my baseline kit, consisting of emf meter and laser thermometer, and digital stills camera. I carried out a partial baseline test and made note of the readings, which all came back as normal, andIi also took the opportunity to take some photographs. A few of the photographs showed up faint orbs, but one photo in particular showed up a very bright, big and distinct orb, this was taken in the cellar, and other photos of the same area came back as normal, with no anomalies. Also on the same visit (which was also combined with a small tour consisting of members of the public) I and several other witnesses all heard a loud rapping sound, just once in the council chambers. We were in a side room at the time, and the sound appeared to emanate from the main chamber where the meeting table was. It was very hard to pinpoint exactly where the sound had came from, but it sounded like one of the heavy wooden chairs being knocked or slightly budged. I took a good look around but couldn't really find out what had caused the sound for sure. I then decided to interview the other people, who were on the tour as to what they thought the sound was, and what may have caused it, however; their questions greatly outnumbered mine, and I answered more than I asked. I have a few theories as to what could cause some of the sounds at least. The Moot Hall sits right on the high street and heavy traffic may cause vibrations through the building. in fact, that has been proven as the building has had to be renovated due to age and the vibrations causing cracks to appear in the walls. It's more than possible that these vibrations may cause sounds to be heard, such as floor boards creaking, and may even cause very slight movement of light objects, depending on weight of traffic. what the reader has to bare in mind at this point is that all kinds of traffic including buses and heavy good vehicles regularly move at speed past the building, this I feel could account for some noises heard, that may have been deemed paranormal in nature. I've listened to the stories concerning the paranormal activity at The Moot Hall several times over, and they never change, this consistency (to me at least) adds to the truth in the stories, if they were made up then details would be forgotten and change, or contradict each other. This has happened on other cases I have investigated that have turned out to be fraudulent. The stories with this case have always been remarkably similar, even when related by different people. There have also been many eye witnesses to events that have occurred, including myself. Photographic evidence for is somewhat hard to locate, I have heard of a photo taken in the prisoners exercise yard that appeared to show the faint outline of a human figure, however I have had no luck locating the person who took the photo, and have not seen it for myself to judge. I have picked up the usual Orbs on digital stills camera, but the debates as to whether Orbs are of paranormal origin is ongoing, and somewhat lengthy (too lengthy to be discussed in full here). One orb photo that I did take is rather interesting, it contains only one single orb, which is very bright and defined, other orb photos I have taken show the orbs as faint specs, these ones I believe to be non paranormal, and caused by some other effect, be it dust or some other explanation. Like I said above, the orb photo I captured at The Moot Hall is large, bright and well defined, not like the other faint orb photo, that's what makes it so interesting. I attempted to research the history of The Moot Hall, in an attempt to find out who might be haunting the The Moot Hall, if this should turn out to be a "classic haunting" and not a poltergeist case (much of the phenomena encountered would suggest that this is a poltergeist case, this I'll explain later) I had a very hard time locating anyone in particular that stands out as having a reason for haunting the building, the only name I can think of as having a real connection is the D'Arcy family, for whom the hall was originally built. I would like now to take a closer look at some of the phenomena encountered. The guide who was kind enough to explain her experiences to me related that she had seen shadows out of the corner of her eye and felt uneasy in the building alone. If I thought I had seen something out the corner of my eye, when I'm supposed to be alone I would feel uneasy as well, I think this is a universal feeling and anyone else would feel the same, these two experiences, although at times may occur independently of one and other, could well be related as memories of seeing the initial shadow would remain in a persons mind, when remembered at a later date would cause uneasy feelings, and therefore auto suggestion may set in. It's very easy to spook ones self. I'm not making any attempt to debunk the stories I have been told, simply because I have had my own experiences within the building, as related above (in the original article). The sounds heard by myself and witnesses were very real, and quite loud at the time, the door closing on one of the upper floors when the building was empty, and the external door to the upper floors being securely locked is most extraordinary because the guide who was with me at the time swore to me that she had (and always does) closed all the doors after the tours leave. This would suggest that for the door to close by it's self, it would have also had to open in the same anomalous manner, therefore we have a potential for two separate paranormal occurrences taking place simultaneously. That is one explanation, another is that the sound was caused by something other than a door closing, and that escaped our attention at the time. To list the different types of phenomena that have taken place (as described by the guide, and witnessed by several people) we have a lengthy list, bangs, movement of objects, photographic anomalies, apparent sightings of apparitions and oppressive atmospheres. All these types of phenomena are standard in a poltergeist case; this would lead me to believe The Moot Hall is also plagued by a poltergeist; the only thing I would have to say is that it must be a place based poltergeist, as there appears to be no obvious human agent involved. I would suggest the guide as a possible agent, even though she doesn't fit the accepted "human agent" profile, and she is not always present when the happenings occur. This case has left me stumped, I have presented you with the evidence, and now I'll leave you to make up your own minds, according to your beliefs.